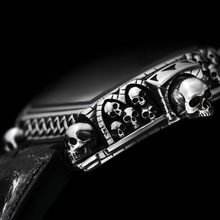 Daniel Strom is delighted to bring forth a novel collection of extraordinary watches, dubbed Agonium. A team of highly qualified professionals has endowed this remarkable line with a contemporary spirit. A magnificent fusion of highly personal design and cutting-edge technology has turned it into a coveted object for watch enthusiasts and collectors. The Daniel Strom Agonium collection includes a new amazing model, created with an idea of life finitude. Appropriately named Memento Mori, Carpe Diem, it makes people appreciate every moment of life, filling it with harmony, set and achieve goals and create something precious for their descendants. The watch, with a great philosophy behind its creation, is available with a breathtaking case, crafted from silver 925, gold, palladium or platinum. The container of the watch, meanwhile, is manufactured from stainless steel. On its front side the case is armed with an anti-glare double curved sapphire crystal. The case construction provides 50-meter water-resistance. The Daniel Strom watch relies on a mechanical self-winding movement - caliber 2824, which serves to animate the functions of hours, minutes and seconds. They are immediately displayed on the dial, clothed in black or bone-white. 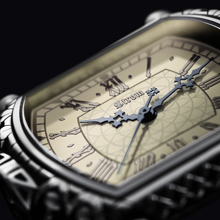 It is completed with Roman numerals and polished steel-hands, presented in white or black. 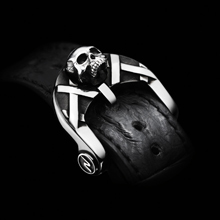 Keeping the Daniel Strom Memento Mori, Carpe Diem watch secured to the wearer’s wrist is an alligator hornback strap, performed in black. The strap is finished with a buckle, done in silver 925, gold, palladium or platinum.